A network license includes one Softimage license, and five Batch licenses. The Softimage license is the “interactive” license: it allows you to run xsi.exe on one computer. 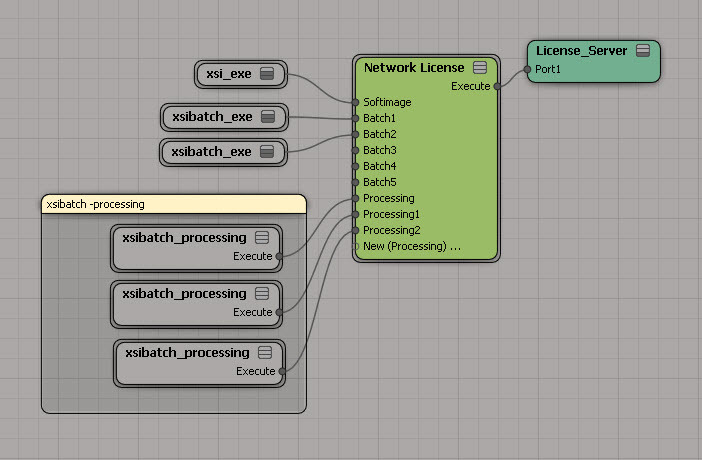 The Batch licenses run xsibatch, and are used for command-line rendering on render nodes. 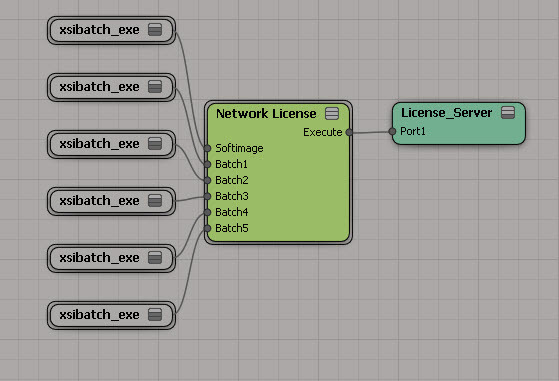 One Batch license = one render node. Each instance of xsi.exe and xsibatch.exe can use up to four satellite computers for satellite rendering. You can run multiple copies of xsi.exe or xsibatch.exe on the same computer. A license is shared as long as processes are running under the same user account and on the same host (aka computer). You can run an unlimited number of xsibatch -processing jobs. With xsibatch -processing, you can do anything except render. Typically you use it to run script jobs on scene files. And finally, you can also use the Softimage license to run xsibatch.